Blogging can do great things for your company’s online presence — it creates organic content search engines look for and drives traffic to your site. It also gives you chances to share with others what you know best. But blogging can be intimidating. Whether you’re deciding on a topic to write about or trying to promote your post, there are lots of ways to miss out on getting the most from your content. So let us help make this whole blogging thing a little simpler. 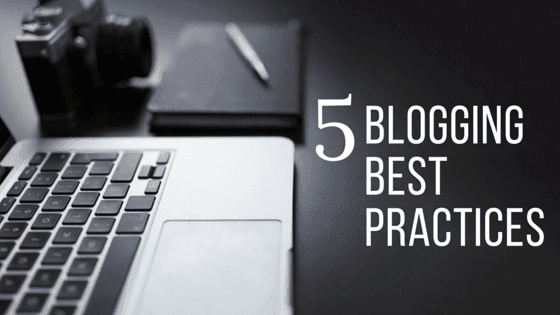 Here are five tips to help you blog your best. 1. Update your blog regularly. If you’re going to blog, you need to commit to doing it regularly. Having a blog on your site that hasn’t been updated in months doesn’t look good — and starting off strong by posting regularly but dropping it a few weeks later looks just as bad. That’s why consistency is key. Before you commit to blogging, make sure you have time for it. Once you start, post regularly and consistently. This lets your audience know when to expect a post from you and keeps your blog looking fresh. Deciding what to write a blog post about can be intimidating, but it’s actually really simple: Write about what you know. You are an expert on what you do, so prove that with the content you create. Take on an authoritative voice and creatively share information related to your industry that your customers shouldn’t be living without. 3. Give your posts a heaping dose of personality. Let’s face it — there are plenty of other places for people to get information. What’s going to make you their go-to source? Your personality. The unique personality of your brand is what makes you different, so use it to your advantage when writing your content. Let it shine through in what you say and how you say it. It’s what will capture people’s interest. When someone comments on one of your posts, it creates a chance for you to have a conversation. Don’t miss out on these opportunities. Engagement not only helps you build relationships with potential customers but also creates a community on your blog. Encourage your readers to leave their comments and respond thoughtfully to what people have to say. So you’ve written your post and published it on your blog. That’s great, but you’re not done yet. To get more eyes on your content, promote your posts on your social media platforms. This gives your followers the opportunity to like and share your content with others, driving traffic back to your site — and that’s where you want people to be. Mopro’s blogging platform makes blogging for your business super easy — call us at 844-207-9038 or email hello@mopro.com to get set up with a website and blog that make you look awesome online.